Because this is the busiest time of year for me it seems I'm having difficulty finding time to do any blogging. The traveling has been brutal with little time in between hunting trips, or as I like to call them around my wife, "business trips." As you might expect, that doesn't fly very well with her. I started in Alberta hunting whitetails and mule deer, then skipped over to Idaho to hunt elk. I stopped off at home for about ten days, then took off to Kodiak Island, Alaska, for a disastrous hunt for Sitka blacktails along the Spiridon River. Hunting buddy Bob Ameen and I dropped onto the river on a float plane and camped in a tent for a week. Over the course of six solid days of hunting, with surprisingly no time lost to bad weather, we spotted exactly zero blacktail bucks. None! We saw a total of 15 does and fawns but the devastation from the brutal winter in Alaska last year was far more serious than expected. The Alaska Fish and Game Department estimates a 35 to 50 percent loss, but based on our experience and reports from numerous hunters who are actually on the ground with the deer, the loss was much worse. Super Slam bowhunter Frank Noska didn't see a single deer or any gender in a solid week. Other hunters and outfitters estimate the loss as high as 90 percent, and I don't think that's far off. It will take three to five years for the deer population on Kodiak to rebound and that's provided they don't have any bad winters in the meantime. Next, I stopped back at home for a day-and-a-half before taking off again on a three-week tour through whitetail country. First stop was southeast Minnesota on October 28. The buck activity was pretty good and I had a great hunt. This was a "print" hunt and not for television, so I got a break from hunting with a cameraman. Don't get me wrong — I don't mind hunting with a good cameraman but it is always a more difficult hunt when there are two of you. No exceptions. Then it was off to Iowa where the rutting activity seemed to slow because of some warmer weather. Field after field of standing corn was left standing due to drought and crop insurance claims, which didn't help either. We didn't see a lot of mature bucks but when we needed it most the action picked up and I took my best whitetail buck to date. From there we went to Kansas and struggled to see a mature buck. Reports of some serious loss to EHD got us thinking some of the bigger bucks seen on trail cameras throughout the summer were lost. It only takes a few such losses to be really noticeable. I enjoyed Thanksgiving with the family and now I'm in an airplane on the way to Northern California to hunt Columbia blacktailed deer. This will be my first time hunting this species and I'm looking forward to the opportunity to add them to my list. I will also be hunting Coues' deer in Arizona in January so on paper I had the "Deer Slam," all five species of North American deer, on my hunt schedule this year. 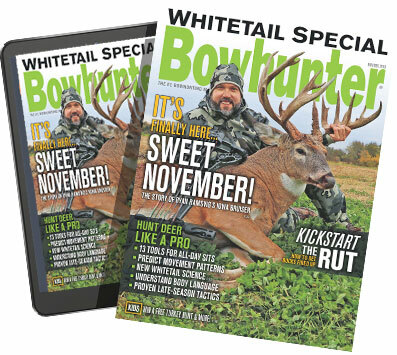 Of course, if you care to know how these hunts turned out you'll have to subscribe to Bowhunter Magazine and watch Bowhunter TV on the Sportsman Channel. Our show is going to 52 weeks in 2013 so we'll be on the air the entire year and hope you can join us for all the action. It probably sounds like I'm asking for sympathy but that's not the case. This is a challenging job but one I wouldn't trade for any other. Stay tuned. I hope you've had a great fall and made some of your own dreams come true.